Apples. They are sheer delight, right? YES! But, sometimes we've got to change things up especially if we have children. Or maybe we use that as inspiration to try more foods? 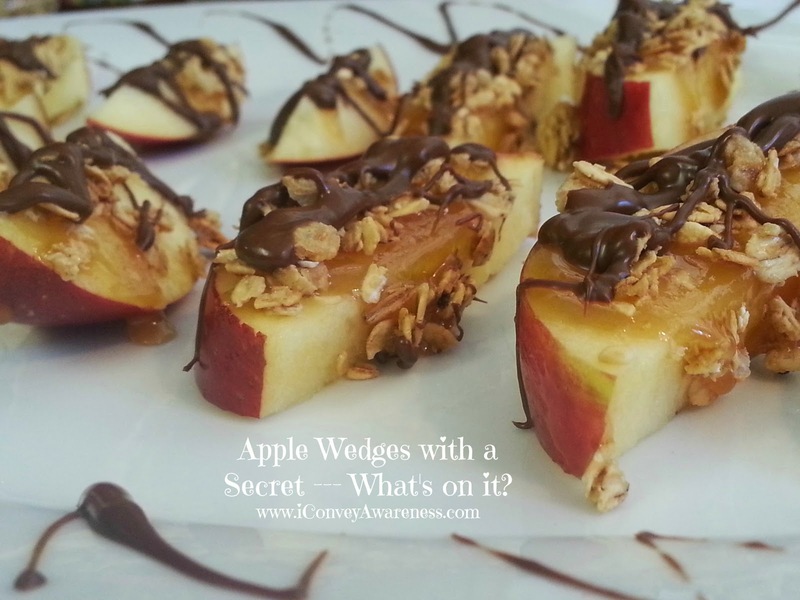 Either way, I like these apple wedges not only for their chocolate and granola toppings but also for their secret ingredient. Can you guess what that is? That secret ingredient is not what you think it is.. or is it? The images I've seen for apple wedges used the chocolate to coat the apple. I used the secret ingredient because I wanted added nutritive benefit and not just added sweetness. The secret ingredient is naturally sweet but it offers so much more! Edit: If you're using cacao powder, I recommend starting with a small batch so you can get the flavor profile you're seeking. I made a batch with 2 tsp of coconut oil, 3 tbs of cacao powder, and 1 tsp of raw honey. I heated the coconut oil and added the cacao (can use cocoa (organic)) powder, stirred and allowed it to bubble on low heat. After a few minutes, I turned off the burner (stir while it's heating) then I added the raw honey. It was somewhat bitter as cacao naturally is so I think I will add maple syrup in lieu of the raw honey next time to give it a slightly different taste. For this rendition, I coated the apples in the cacao (after it cooled) then I topped it with crushed walnuts and almonds (you can sub seeds if allergic to tree nuts). Pretty good! 1. Melt the chocolate and the coconut oil together. This will eventually create a shell over the granola. 2. Take the ... raw honey [secret ingredient] and spoon a little on each wedge (may need to use two spoons to keep one clean at all times to dip again for more honey). The honey may slide down the sides of the wedges but that's great! The more the merrier! 3. 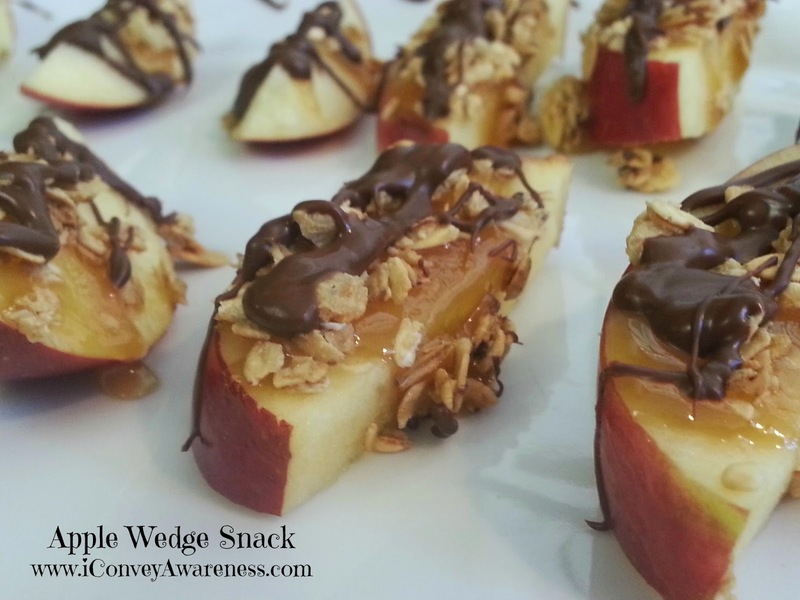 Sprinkle the granola over the honey on the apple wedges. 4. Drizzle the melted chocolate over the granola. Hi Sandy, should you make them, I'd love to hear about your experience. Yum! These look and sound delicious plus have such healthy ingredients. Is a great way to get kids to eat fruit. Will share on Pinterest and google. Thanks for sharing. Visiting from Healthy Happy Green & Natural Blog Hop. Thanks so much ladies for leaving a comment. If you should decide to make them this way, feel free to come back and update with your personal take on them. I love cacao on anything - definitely will try apples! Depending on one's taste buds, the cacao may be bitter so adding a drop or two of raw honey or maple syrup may balance out the bitterness but it appears you'll be fine since it's a favorite on your palate. Thanks for your comment! These really do look delicious! I love chocolate on just about anything! What a healthy and delightful dessert you have created! Apples and chocolate in one heavenly bite! Thank you so much for sharing this healthy and delicious recipe on the Healthy, Happy, Green & Natural Blog Hop! I appreciate it! So much delicious and great food of English Country Pub.It is very easy to increase the recipe for a crowd.I love it thanks for sharing..
Veggie Panini with Herb "Fries"